Galco MC248 Miami Classic Shoulder Holster FREE SHIPPING! Most branches of the military, federal law enforcement, and local police agencies have put Galco holsters to work for them. 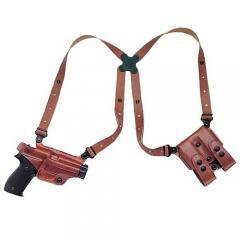 A key component of the Galco Miami Classic shoulder holster system is its spider harness (fits up to 52" chest). All four points of the Galco Miami Classic spider harness can pivot independently and are connected by a unique clover shaped Flexalon swivel back plate, which is a Galco trademark. This results in a perfect fit and lasting comfort for all sizes and shapes. The Galco Miami Classic shoulder holster is constructed of premium saddle leather and includes holster, harness and ammo carrier. Very satisfied with the product The break in period for the weapon took a bit of working with and after a couple of days everything fit really well. Also after getting the rig adjusted and tweaked to fit me this rig is comfortable to wear all day long. This is a well made product for the price. Very comfortable to wear if you spend a lot of time in a vehicle or sitting. Very comfortable, holds my pistol securely. Excellent fit easily set up, should come with a tie down. Very comfortable Glad that I selected this choice. Great holster but side straps should have been included. Shipping was on time. Love my Miami Classic rig. Took less than a week to receive it. Fits my Springfied XD Mod2 perfectly. Love it. The leather straps are not stiff, yet the holster is firmly molded. Perfect all around. It is a well made holster as are all of the Galco holsters it has a excellent fit holds the gun well and the straps are easy to use and adjust I like it because with a light jacket it's the way to go. Great holster and great price. Easy to set up and comfortable to wear. Concealed with only a button down shirt. Super fast shipping, ordered Wednesday before Thanksgiving and received on that Saturday. My gun is IMI Jericho and 45 norinco, and i dont see it in the gun list, which has the same size as my gun?. You sure get what you pay for, I tried the cheep ones and could not use them through a day but not these Galco I can use all day long. Very good equipment, thank you. Good quality leather. Perfect fit on weapon. Worth the money. I'd buy it again. Extremely comfortable,beretta 92fs with a full mag and 2 full mags on the other side and it wears like its not even there. Recommended it to many so far and will continue to. My father in law loved it. Wasn't a good fit. Had to soak with water and let gun and magazines sit in them to get them to fit. And leather isn't that great of a quality. I like the fact it was just like described. fits my pistol well. The mag pouch & holster are top grade, thick, tough, beautiful, last a lifetime, but the quality of the straps is not exactly what I wanted. The leather, although it's soft and supple, is also stretchy & light weight. I do love it, but only 4 stars. Thank you for allowing me to comment on your high quality product. It takes a little time to break in just follow instructions for excellent fit. High quality. Can a khar cw40 be used with this product ? Yes it will fit. Please select "Kahr CW40" as your fit. Yes, it will fit the XDM 9mm with 4.5" bbl. ©2002-2019 CopsPlus.com: Galco MC248 Miami Classic Shoulder Holster FREE SHIPPING!